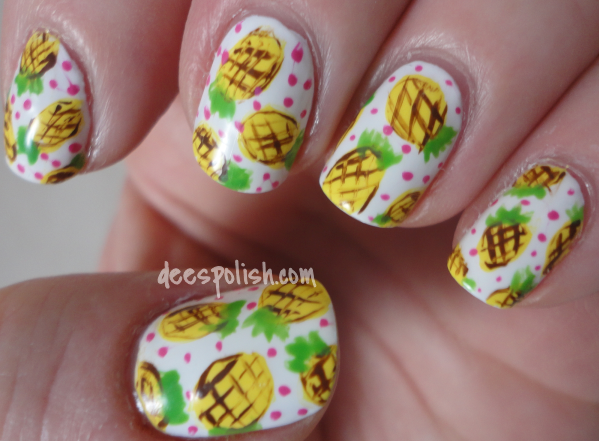 I came across a tutorial for some seriously adorable nails.. and I knew I had to copy them immediately because the nails featured pineapples, and to me, pineapples scream summer.. and.. well, it is summer right now, so, it was basically the perfect time. Makes sense, right?! I followed THIS TUTORIAL for the most part.. kind of took my own spin, but that is usually how that works, for me anyways..
Then, once they were done, I thought to myself: 'there is too much blank space', and I quickly added in some pink dots. Perfection! Also, the day I was first sporting these nails, I got a message from Nail Polish Canada about a Summer Nail Art Challenge - ahh fitting, these are a perfect entry for that! Two birds, meet one stone. I did receive sooo many compliments on these nails! I even received a few comments asking if they were jamberry nails, and then when they found out I did them myself, they were sad because they wanted to order them. Ahh.. good times! That is all for now -- see you all again soon!! P.S -- if you have looked at these and thought 'hey, these are actually quite cute!' then maybe you could spare another moment, head on over HERE, and give me a little vote-ski? That would be rad!